Chloroform was once commonly used as an anesthetic. 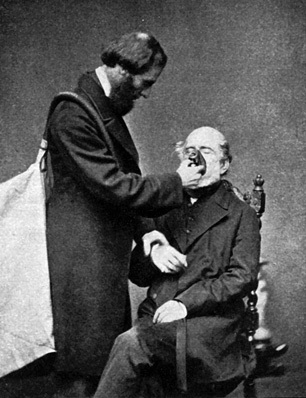 In this photo from 1862, chloroform is being delivered to a patient. Trihalomethanes are a group of similarly-structured chemical compounds that can form as a result of chlorine or chloramine reacting with natural organic matter in water. They're used in industry to manufacture further chemicals, refrigerants, pesticides and propellants. Chloroform, the most common THM, was at on time used in anesthetics, tooth polishes, balms and cough medicines. THMs can arrive in drinking-water through industrial waste, but they are more common as by-products of water disinfection. The most common THMs found in drinking water are chloroform (chemical name CHCl3), bromodichloromethane (BDCM, also known as dichlorobromomethane or CHBrCl2 ), dibromochloromethane (DBCM, also known as chlorodibromomethane or CHClBr2) and bromoform. Water source. Water sourced from surface water tends to have more organic matter than water sourced from groundwater. Temperature. THMs form more regularly during warmer months, when organic matter is more prevalent. Concentrations double during the hottest months. Duration. The duration of exposure to chlorine and chloramines can affect the total trihalomethane count. THMs increase as water is continually exposed to residual chlorine in treatment plants and domestic hot water tanks. Chlorination pH. Trihalomethanes form more readily in higher pH conditions. Concentration. The levels of chlorine, humic acid, and bromide ions will all affect the total trihalomethane count. In general, according to the World Health Organization, smaller municipalities “with less sophisticated treatment systems had higher THM levels in their drinking-water.” Human exposure to THMs may also occurs through foods (especially dairy products), swimmming pools and hot tubs, and consumer products such as pens and housewares. Trihalomehanes may be treated with a combination of air stripping and granular activated carbon. Reverse osmosis has also been shown to reduce levels of THMs. Ideally, the formation of high levels of trihalomethanes will be prevented during water treatment by the reduction of THM precursors and regulation of pH.